"Dove – the popular name of several species of Columbae. . also called pigeons. . . (a) species called Doves. . .the TURTLE DOVE, etc." – Webster's 20th Century Dictionary. "The dove was a rabbinical symbol for Israel as a nation, but Christians have come to consider it a symbol of the HOLY SPIRIT doubtless because the Spirit descended like a dove at Jesus' baptism (Malt 3:16). The dove was used in the tabernacle. . . and temple. . . sacrifices." – S.D.A. Bible Dictionary. Both terms (Dove and Holy Spirit) are used to translate "Yonah". . .
"In the sacrificial code the dove and the turtle-dove were the only birds admitted as sacrifices. . ." – The Jewish Encyclopedia, vol. 4, p. 644. "108. To Hebrew Common Nouns belong Gender, Number, and Case. "109. There are in Hebrew TWO GENDERS, the MASCULINE and the FEMININE. The (so-called) Neuter Gender of other languages is in Hebrew GENERALLY SUPPLIED BY THE FEMININE . . . . Note: From Adam (masculine), Eve (feminine), was formed, TWO, a male and female from ONE masculine. "113. Abstract Nouns are generally FEMININE (answering to the neuter in Greek and Latin). "114. Many names of Animals may be either Masculine or Feminine. . . . Common Gender . . . . Some, however, are. . . ALWAYS FEMININE, as. . . DOVE." – Ibid. In the Sacrificial Offerings, one Turtle DOVE represented a female offering by fire, an INTERCESSOR. "Behold, thou art fair, my love; behold, thou art fair; thou hast doves' eyes." Song of Solomon 1:15. "My beloved is white and ruddy, the chiefest among ten thousand . . . . His eyes are as the eyes of doves by the rivers of waters, washed with milk, and fitly set." Song of Solomon 5:10,12. MALE dove! "His cheeks are as a bed of spices, as sweet flowers: his lips like lilies, dropping sweet smelling myrrh." Song of Solomon 5:13. "Behold upon the mountains the FEET of HIM that bringeth good tidings, that publisheth peace!" Nah. 1:15. "Who is this that cometh up from the wilderness, leaning upon her beloved? I raised thee up under the apple tree: there thy mother brought thee forth: there she brought thee forth that bare thee." Song of Solomon 8:5. "Whither is thy beloved gone, O thou fairest among women? whither is thy beloved turned aside? that we may seek him with thee. . . Thou art beautiful, O my love, as Tirzah, comely as Jerusalem, terrible as an army with banners . . . . My dove, my undefiled is but one; she is the only one of her mother, she is the choice one of her that bear her. The daughters saw her, and blessed her; yea, the queens and the concubines, and they praised her. Who is she that looketh forth as the morning, fair as the moon, clear as the sun, and terrible as an army with banners?" Song of Solomon 6:1, 4, 9, 10. A FEMALE DOVE. Behold HER, "How beautiful are thy feet with shoes (hoofs of brass, Mic. 4:13), O prince's daughter! the joints of thy thighs are like jewels, the work of the hands of a cunning workman." Song of Solomon 7:1. "Though ye have lien among the pots, yet shall ye be as the wings of a dove covered with silver, and her feathers with yellow gold." Ps. 68:13. "But they that escape of them shall escape, and shall be on the mountains like doves of the valleys, all of them mourning, every one for his iniquity." Eze. 7:16. "They shall tremble as a bird (Dove) out of Egypt, and AS A DOVE OUT OF THE LAND OF ASSYRIA: and I will place them in their houses, saith the Lord. Ephraim compasseth me about with lies, and the house of Israel with deceit: BUT JUDAH (a Dove) YET RULETH WITH GOD, AND IS FAITHFUL WITH THE SAINTS." Hos. 11: 1 1,1 2. Therefore, two Doves, Israel (10 tribes) and Judah (2 tribes). "BEHOLD, I SEND YOU FORTH as sheep in the midst of wolves: be ye therefore wise as serpents, and harmless AS DOVES." Matt. 10:16. "And if she be not able to bring a lamb, then she shall bring two turtles (doves), or two young pigeons; the one for the burnt offering, and the other for a sin offering: and the priest shall make an atonement for her, and she shall be clean." Lev. 12:8.
there was a man in Jerusalem, whose name was Simeon; and the same man was just and devout, waiting for the consolation of Israel: and the Holy Ghost was upon him. And it was revealed unto him by the Holy Ghost, that he should not see death, before he had seen the Lord's Christ. And he came by the Spirit into the temple: and when the parents brought in the child Jesus, to do for him after the custom of the law, Then took he him up in his arms, and blessed God, and said, Lord, now lettest thou thy servant depart in peace, according to thy word: For mine eyes have seen thy salvation, Which thou hast prepared before the face of all people; A light to lighten the Gentiles, and the glory of thy people Israel. And Joseph and his mother marvelled at those things which were spoken of him. And Simeon blessed them, and said unto Mary his mother, Behold, this child is set for the fall and rising again of many in Israel; and for a sign which shall be spoken against; (Yea, a sword shall pierce through thy own soul also,) that the thoughts of many hearts may be revealed. And there was one Anna, a prophetess, the daughter of Phanuel, of the tribe of Aser: she was of a great age, and had lived with an husband seven years from her virginity; And she was a widow of about fourscore and four years, which departed not from the temple, but served God with fastings and prayers night and day. And she coming in that instant gave thanks likewise unto the Lord, and spake of him to all them that looked for redemption in Jerusalem." Luke 2:21-38. ". . . a pair of turtledoves (male and female). . . As an offering for the mother . . . . These offerings (two turtledoves) represented Christ. . ." – The Desire of Ages, p. 50. 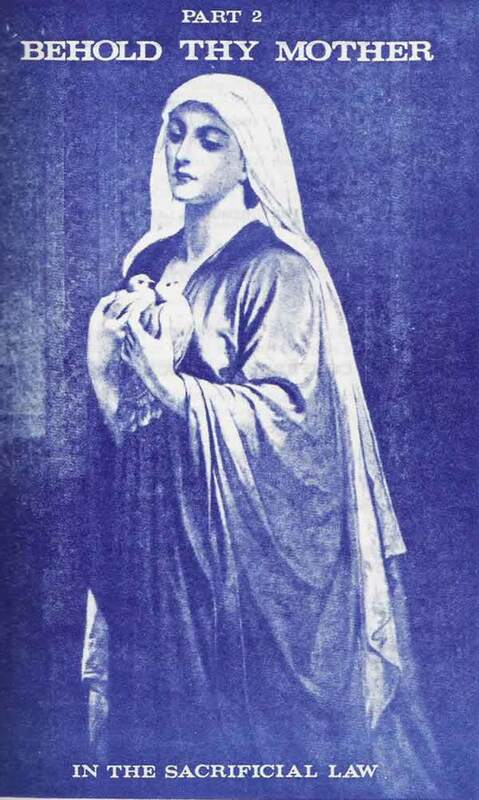 Therefore, the two doves represented Mary and her Son – a symbol of TWO INTERCESSORS, CHRIST and the HOLY SPIRIT in the Sanctuary service in TYPE, and which prefigured TWO INTERCESSORS (Rom. 8:26,34) in the ANTITYPICAL Sanctuary service beginning A.D. 31 on the DAY of Pentecost. At the crucifixion, Jesus was the sacrificial lamb for the JEWISH NATION which was SYMBOLIZED BY A DOVE. At the OFFERING for the FIRSTBORN, BOTH Jesus and His mother were represented by TWO DOVES, a male and a female: Mary, a symbol of the Holy Spirit Mother in Heaven, Jesus representing Himself, "come down" from Heaven, as the blood sacrifice on the cross. THAT the SACRIFICIAL OFFERINGS, both Male and Female, the types and symbols of the earthly Sanctuary, are SHADOWS that reveal Christ and the Holy Spirit, Male and Female, as the True Sacrifices and Peace Offerings to God, the Father, in the redemption of His lost creation. THAT Adam, a created son of God, and Eve, a created daughter of God, were exact IMAGES of Christ, the Son, and the Holy Spirit, the Mother, in FORM AND FEATURE. "In the beginning, man was created in the likeness of God, not only in character, but in form and feature." – The Great Controversy, pp. 644, 645. THAT Adam and Eve were "as God" who ministered in the affairs of His church, His Sanctuary Throne on earth: He (Adam), the Priest; She (Eve), representing the Temple (woman), THE CHURCH, the "only" connection between earth and Heaven through the "Divine Presence" – the Holy Shekinah. THAT the story of Noah and the Dove symbolized two Deliverers: Christ, a son of God (righteous Noah), and the Dove (she), with an olive "branch" in her mouth, a symbol of the Holy Spirit (Gen. 8:11). The same IMAGE (MALE AND FEMALE) was demonstrated and preserved in the ark by Noah and the Dove (she). "But the dove found no rest for the sole of her foot, and the returned unto him into the ark, for the waters were on the face of the whole earth: then he put forth his hand, and took her, and pulled her in unto him into the ark." Gen. 8:9. THAT in the allegory of Abraham and Sarah, the images of the whole family of God were represented: (1) Abraham, God the Father; (2) Sarah, God the Holy Spirit Mother (Gal. 4:26); and (3) Isaac, God the Son, a type of Christ (Gal 4:28; D.A. 112,113). Again, it is shown that the Trinity is represented as MALE AND FEMALE. THAT Isaac and Rebekah, who had a son in the flesh, were earthly images of Christ and the Holy Spirit. She clothed him (JACOB) in animal skins (hair) to receive his father's blessing for the first born (Priesthood) until he should overcome sin and receive a NEW NAME – Israel. THAT Rebekah's act was prefigured by the Holy Spirit Mother of Heaven, Melchizedek, Who clothed Adam and Eve in animal skins (hair) after they sinned and lost their original covering of light (a perfect knowledge of the Trinity as MALE and FEMALE). THAT Rebekah officiated in the capacity of a priest in preparing the offering for the DOUBLE blessing of the firstborn to be given to Jacob. It was she who made the arrangement whereby he received the coveted birthright. ence upon God by persevering prayer and wrestling with the Mighty Angel, whereupon he gained the title, Israel, Prince of God, to replace his carnal title of Supplanter-deceiver. THAT through prophetic vision Jacob interpreted Joseph's dream of the sun, moon, and stars bowing to Joseph to be a picture of his own family as the EVER LIVING CHURCH OF GOD ON EARTH: The sun representing Jacob, the moon representing his wife, and the stars representing his sons. THAT the church on earth being an IMAGE of the heavenly church with a Father, God, a Mother, the Holy Spirit, and children, the Son, as depicted by Jacob's family, demonstrates the MASCULINE AND FEMININE balance in the Trinity above. THAT Jacob's NEW name is indicative of the NEW NAME the descendants of the twelve tribes, the 144,000, will receive, when they are sealed with the three-fold seal of the overcomer (Rev. 2:17; Early Writings, p. 15), the name of the man Who is The Branch, our Intercessor (The Great Controversy, p. 415). Jesus prophesied of "another" Comforter, Intercessor, to come in His OWN NAME, even the Holy Spirit (John 14:26) Who would lead the disciples of Jesus into all the truth about the Trinity and their wonderful plan of redemption through the intercessory work of Christ and the Holy Spirit, Two Turtle Doves (Luke 2:24), a Male and a Female sacrifice for sin and uncleanness. THAT the PROMISE was given TO EVE of a Son Who should bring the RESTORATION of that original LIGHT AND GLORY back to those who overcome and receive His NEW NAME, through the power of the HOLY SPIRIT IN A MESSAGE OF TRUTH. Jesus was our example of the coming of "ANOTHER" Comforter, the Holy Spirit, a Messiah – Deliverer, in His name, in the flesh (His flesh). Thus He became a Saviour of the world through the Eternal Spirit (Heb. 9:14), as those (Obadiah 21) who overcome and receive the three-fold NEW NAME of the Trinity – God, New Jerusalem, and Jesus' NEW NAME (Rev. 2:17; 3:12). THAT we can more clearly visualize the act of creation by Melchizedek, the Heavenly Mother, when She prepared a covering ("Wherefore when he cometh unto the world, he saith, Sacrifice and offering thou wouldest not, but a body hast thou prepared me." Heb. 10:5) of flesh for Her Son (Who was first a Spirit being) to veil His Divinity. Thus mankind could SEE Her Son Who was the express IMAGE of His Father's PERSON (Heb. 1:3), and know that the Father was represented as a masculine person of the Godhead. THAT ANOTHER Person of the Godhead was represented in both Eve and Mary who were IMAGES of the Holy Spirit, the HEAVENLY MOTHER of the Son of God. THAT before His birth Mary, Jesus' earthly Mother (as an image of the Heavenly Mother, the Holy Spirit), was Jesus' "covering" in the flesh in that He was, as an unborn infant, "surrounded" by "water," a symbol of the Holy Spirit. This state of being was a symbol of His future baptism by immersion in the water of the River Jordan; whereas His natural birth (emergence from the "water") was a symbol of His future emergence from the waters of the Jordan at His baptism. The Dove encircling Him in a beam of purest light (D.A., 111, 113) symbolized His spiritual (re)birth, or the "'anointing"' by the Holy Spirit, for His ministry. THAT Jeremiah 31:22 is the prophecy of not only the birth of Jesus, Who in His humanity was surrounded, "covered" by a woman before He was born, but also a prophecy of the latter-day promise of a message called The Branch, She (Jer. 33: 15,16) which provides a COVERING (righteousness of Christ) for The Branch, He (Jer. 23:5,6). "For the Lord hath CREATED a NEW THING (a new Truth) . . . A WOMAN shall compass (encircle) a man." THAT when Christ came HE WAS THE ONE FORESHADOWED IN THE SACRIFICIAL OFFERINGS Who would reveal "another ONE," to come "after Him," the Holy Spirit (feminine) before the Eternal Throne in the Sanctuary above, the Eternal High Priest, Melchizedek or the Holy Shekinah. THAT the Sanctuary Service of the TIMES of the holy feasts (sabbaths) of the Lord (Lev. 23) were not changed by Jesus at the cross for the Scripture says "he (Jesus) shall cause the SACRIFICE (replaced the animal with Himself as the Lamb) and the oblation to CEASE" (Dan. 9:27); but rather, that the papacy changed the TIMES of the feasts, "And he (the pope) . . . think(s) to CHANGE TIMES (plural: the FEASTS of Lev. 23) and LAWS (Ten Commandment and Ceremonial Law." (Dan. 7:25). THAT Jesus did reveal "another" High Priest to come in the prophecy of John 14:26, "another" Comforter Who, in the "times" of the restitution (re-creation) of all things would finally blot out the sins of God's people in the "times" of refreshing from the Presence of the Lord, the Holy Spirit. THAT Scriptural evidence clearly shows that, IN GENDER, God's creation, not only in the human family, but in the animal and vegetable world, as well, are in THEIR IMAGE, as male and female. Genesis 1: Verses 21, 22: "And God (Eloh – Feminine, im – masculine; plural Gods) created... every winged fowl after his kind (MALE AND FEMALE) . . . . (Verse 20: 'fowl that may fly above the earth in the open firmament of heaven.') and let fowl multiply in the earth." Genesis 1: Verses 26, 27: "And God said, Let us (Male and Female) make man ('Adham' – the word for human being) in our image, after our likeness: and let them (male and female) have dominion over the fish of the sea, and over the fowl of the air, and over the cattle, and over all the earth, and over every creeping thing that creepeth upon the earth. So God created man (AdHam) in his own image, in the image of God created he him; male and female created he them." Genesis 3: Verse 21: "Unto Adam also and to his wife did the Lord God make coats of skins, and clothed them." Genesis 6: Verses 18-20: "But with thee (Noah) will I establish my COVENANT . . . . And of every living thing of all flesh, two . . . shalt thou bring into the ark, to keep them alive with thee; THEY SHALL BE MALE AND FEMALE . . . . Of fowls after their kind." Genesis 7: Verse 2: "Of every clean . . . thou shalt take to thee by SEVENS, the MALE and his FEMALE." Genesis 8: Verses 8, 9: "Also he (Noah) sent forth a DOVE from him .... But the dove found no rest for the sole of HER foot, and SHE returned . . ." to the ARK for rest, symbolizing the resting of the Holy Spirit (Dove) upon the mercy seat of the ARK in the earthly Sanctuary. returned not again unto him any more." Verse 20: "And Noah builded an altar unto the Lord; and took of every clean beast, and of every clean fowl, and offered burnt offerings on the altar." Genesis 15: Verse 1: "After these things the word of the Lord came unto Abram in a vision, saying, Fear not, Abram: 1 am thy shield, and thy exceeding great reward." Verse 4: "He that shall come forth out of thine own bowels shall be thine heir ('one to come')." Verse 5: "And he brought him forth abroad, and said, Look now toward heaven, and tell the stars, if thou be able to number them: and he said unto him, So shall thy seed be." Verse 6: "AND HE BELIEVED IN THE LORD; AND HE COUNTED IT TO HIM FOR RIGHTEOUSNESS." Verse 7: "And he said unto him, I am the Lord that brought thee out of Ur of the Chaldees, to give thee this land to inherit it." Verse 8: "AND HE SAID, LORD GOD, WHEREBY SHALL I KNOW THAT I SHALL INHERIT IT?" Verse 9: "And he said unto him, Take me an heifer of three years old, and a she goat of three years old, and a ram of three years old, and a turtledove, and a young pigeon." Abraham received instructions from God about the symbolic offerings of the Sacrificial Law in conjunction with the promise to the land. The animal and bird sacrifices, which depicted the Temple services to be established in Jerusalem, were SHADOWS of the Heavenly INTERCESSION of the True Doves, Jesus and the Holy Spirit. Verse 10: ". . but the birds divided he not (Jesus and the Spirit were undivided)." Verse 13: "And he said unto Abram, Know of a surety that thy seed shall be a stranger in a land that is not theirs, and shall serve them; and shall afflict them four hundred years." Verse 16: "But in the fourth generation they shall come hither again." Verse 17: ". . behold, a smoking furnace, and a burning lamp that passed between those pieces (a symbol of God's Divine Presence consuming the sacrifices)." Verse 18: "In the same day the Lord made a COVENANT with Abram, saying, Unto thy SEED (by Sarah, Hagar, and Keturah – Gen. 25:1 – three wives) have I given this land, from the river of Egypt unto the great river, the river Euphrates." Genesis 17: Verses 1,5,7: "And when Abram was ninety years old and nine, the Lord appeared to Abram, and said unto him, I am the Almighty God; walk before me, and be thou perfect .... Neither shall thy name any more be called Abram, but thy name shall be Abraham; for a FATHER of many nations have I made thee .... And I will establish my covenant between me and thee and thy seed after thee in their generations for an everlasting covenant, to be a God unto thee, and to thy seed after thee." Verse 16: "And I will bless her, and give thee son also of her: yea, I will bless her, and she shall be a MOTHER of nations; kings of people shall be of her." The NEW NAME that BOTH Sarah and Abraham received was prophetic of the NEW NAME Jacob received as an overcomer, pointing to the NEW NAME of Jesus (Rev. 3:12; 2:17), which Israel, the 144,000 will receive as OVERCOMERS. Genesis 24: Verse 7: "The Lord God of heaven, which took me from my father's house, and from the land of my kindred, and which spake unto me, and that sware unto me, saying, UNTO THY SEED will I GIVE THIS LAND." The promise was of the land "as Eden" restored on earth and given to Abraham's SEED (Jer. 23 and 33; Isa. 51:3; Eze. 36:35). In receiving a NEW NAME Abraham AND Sarah, like Adam and Eve, were SYMBOLS of God the Father and God the Mother – Holy Spirit, to bring TO THE NEW BIRTH, to make all nations "of one blood" (Acts 17:26), through the blood of One, Jesus Christ. Jeremiah 8: Verse 7: "Yea, the stork in the heaven knoweth HER appointed times; AND THE TURTLE (DOVE). . .observe(s) the TIME of.. .(HER) coming; BUT MY PEOPLE KNOW NOT THE JUDGMENT OF THE LORD (when their judgment begins – the judgment of the Living)." The Desire of Ages, page 50 shows that in the offering for the poor, a pair (a male and a female) of turtledoves represented the mother (female) and the first born Son (male). Song of Solomon 2: Verse 12: "The flowers appear on the earth; the TIME of the singing of BIRDS (two turtledoves) is come, and the VOICE of the TURTLE (Dove) is heard in our land (God's Voice declaring the Judgment of the Living)." "In the sacrificial code the dove and the TURTLEDOVE were the ONLY birds admitted as sacrifices." – The Jewish Encyclopedia, vol. 4, p. 644. Leviticus 1: Verse 14: "And if the BURNT SACRIFICE for his offering to the Lord be of fowls, then he shall bring his offering of TURTLEDOVES, or of young pigeons." an offering made by FIRE, of a sweet savour unto the Lord." Leviticus 5: Verse 6: ". . a FEMALE. ..lamb or a kid... sin offering. . an atonement for him concerning his sin (read Verses 1-5)." Verse 7: "And if he be not able to bring a lamb (female). . then he shall bring... two turtledoves (a female and a male), one for a sin offering... the other (one) for a burnt offering." Verse 8: ". . but shall not divide it asunder." Leviticus 12: Verse 6: "And when the days of her purifying are fulfilled, for a son, or for a daughter, she shall bring a lamb of the first year for a burnt offering, and a young pigeon, or a turtledove, for a sin offering, unto the door of the tabernacle of the congregation, unto the priest." Verse 8: "And if she be not able to bring a lamb, then she shall bring two turtles (doves); or two young pigeons; the one for the burnt offering, and the other for a sin offering: and the priest shall make an atonement for her, and she shall be clean." Leviticus 14: Verse 2: "This shall be the law of the leper in the day of his cleansing: He shall be brought unto the priest." Verses 4-7: "Then shall the priest command to take for him that is to be cleansed two birds (doves or pigeons) alive and clean, and cedar wood, and scarlet, and hyssop: And the priest shall command that one of the birds be killed in an earthen vessel over running water: As for the living bird, he shall take it, and the cedar wod, and the scarlet, and the hyssop, and shall dip them and the living bird in the blood of the bird that was killed over the running water: And he shall sprinkle upon him that is to be cleansed from the leprosy seven times, and shall pronounce him clean, and shall let the living bird loose into the open field." Verse 10: "And on the eighth day he shall take two he lambs without blemish, and one ewe lamb of the first year without blemish, and three tenth deals of fine flour for a meat offering, mingled with oil, and one log of oil." be a sin offering (blood), and the other a burnt offering (fire). And he shall bring them on the eighth day for his cleansing unto the priest, unto the door of the tabernacle of the congregation, before the Lord... the priest shall wave them for a wave offering before the Lord." Verses 30,31: "And he shall offer the one of the turtledoves, or of the young pigeons, such as he can get; Even such as he is able to get, the one for a sin offering, and the other for a burnt offering, with the meat offering: and the priest shall make an atonement for him that is to be cleansed before the Lord." Verse 32: "This is the law of him in whom is the plague of leprosy, whose hand is not able to get that which pertaineth to his cleansing." Leviticus 14: Verses 49,50,52.54: "And he shall take to cleanse the house two birds (doves or pigeons), and cedar wood, and scarlet, and hyssop: And he shall kill the one of the birds in an earthen vessel over running water .... And he shall cleanse the house with the blood of the bird, and with the running water, and with the living bird, and with the cedar wood, and with the hyssop, and with the scarlet: But he shall let go the living bird out of the city into the open fields, and make an atonement for the house: and it shall be clean. This is the law for all manner of plague of leprosy, and scall." Leviticus 15: Verses 13-15: "And when he that hath an issue is cleansed of his issue; then he shall number to himself seven days for his cleansing, and wash his clothes, and bathe his flesh in running water, and shall be clean. And on the eighth day he shall take to him two turtledoves, or two young pigeons, and come before the Lord unto the door of the tabernacle of the congregation, and give them unto the priest: And the priest shall offer them, the one for a sin offering, and the other for a burnt offering; and the priest shall make an atonement for him before the Lord for his issue." Read Leviticus 15:29,30. Leviticus 16: Verse 3: "Thus shall Aaron come into the holy place: with a young bullock for a sin offering, and a ram for a burnt offering." Verse 5: "And he shall take of the congregation of the children of Israel two kids of the goats for a sin offering, and one ram for a burnt offering." Verse 7: "And he shall take the two goats, and present them before the Lord at the door of the tabernacle of the congregation." Verse 9: "And Aaron shall bring the goat upon which the Lord's lot fell, and offer him for a sin offering (blood)." to let him go for a scapegoat into the wilderness (alive - a live offering)." Note there are two sin OFFERINGS: one dead, ONE ALIVE. Verse 15: "Then shall he kill the goat of the sin offering, that is for the people, and bring his blood within the veil, and do with that blood as he did with the blood of the bullock, and sprinkle it upon the mercy seat, and before the mercy seat." Verse 18: "And he shall go out (of the Most Holy Place) unto the altar that is before the Lord (Holy Place), and make an atonement for it; and shall take of the blood of the bullock, and of the blood of the goat, and put it upon the horns of the altar round about." Verse 20: "And when he hath made an end of reconciling the holy place, and the tabernacle of the congregation, and the altar, HE SHALL BRING THE LIVE GOAT." Verses 21,22: "And Aaron shall lay both his hands upon the head of the LIVE GOAT, and confess over him all the iniquities of the children of)srael, and all their transgressions in all their sins, putting them upon the head of the goat, and shall send him away by the hand of a fit man into the wilderness: And the goat SHALL BEAR UPON HIM ALL THEIR INIQUITIES unto a land not inhabited: and he shall LET GO the goat in the wilderness." The DEAD goat did NOT make the FINAL atonement. The Levitical Law shows a DEAD and a LIVE offering for sin and uncleanness. Verse 21 shows the FINAL ATONEMENT is made in the HOLY place, NOT in the Most Holy. There were TWO SIN OFFERINGS: ONE SLAIN, ONE LEFT ALIVE, for a full atonement FINAL separation of SIN from the camp of Israel. As in the offering for UNCLEANNESS, the law required one DEAD BIRD, and one LEFT ALIVE, to be let go in the field: these are symbols of TWO MEDIATORS – one who died one EVERLIVING – Christ and the Holy Spirit. Meditation: Verse 34: "And this shall be an EVERLASTING STATUTE unto you, TO MAKE AN ATONEMENT for the children of Israel for all their sins ONCE a year. And he did as the Lord commanded Moses." Leviticus, Chapters 1.14, deal with the offerings for UNCLEANNESS, but the Scriptures say for SIN AND uncleanness. Therefore Leviticus, Chapter 16, deals with the YEARLY Sacrificial offerings for BOTH, TYPIFYING the Final Atonement. Zechariah 13: Verses 1,9: "IN THAT DAY (the great judgment Day) there shall be a FOUNTAIN (OPENED) TO THE HOUSE OF DAVID and to the inhabitants of Jerusalem for SIN and for UNCLEANNESS. . . And I will bring the THIRD PART through the fire, and will refine them as silver is refined, and will try them as gold is tried: they shall call on MY NAME, and I WILL HEAR THEM: I will say, IT IS MY PEOPLE: and they shall say, THE LORD IS MY GOD." " 'In that day there shall be a FOUNTAIN opened TO the HOUSE OF DAVID and TO the INHABITANTS OF JERUSALEM FOR SIN AND FOR UNCLEANLINESS.' (Zech. 13:1). Note that this FOUNTAIN is able to wash away two things; first sin, and second UNCLEANNESS. What is the difference between the one and the other? 'Sin is the TRANSGRESSION of the LAW.' (1 John 3:4) And the result of sin is the decay of the body. 'Speak unto the children of Israel, and say unto them, When any man hath a running issue out of his flesh, because of his issue HE IS UNCLEAN.' (Lev. 15:2.) The Biblical term for sickness is, 'UNCLEANNESS.' Also, taking into the body the form of food of that which is forbidden by the Word of God, is TRANSGRESSION OF THE LAW, and corruption of the BODY (uncleanness)." – 2 S.R. 290,291. "And ALMOST all things are by the law purged with blood (some, by fire); and without shedding of blood is no remission. It was therefore necessary that the patterns of things in the heavens should be purified with these; but the heavenly things themselves with better sacrifices than these (ceremonial offerings). For Christ is not entered into the holy places made with hands, which are the figures of the true; BUT INTO HEAVEN ITSELF, NOW TO APPEAR IN THE PRESENCE OF GOD FOR US." Hebrews 9:22-24. "His intercession is that of a pierced and broken body, of a spotless life. The wounded hands, the pierced side, the marred feet, plead for fallen man, whose redemption was purchased at such infinite cost." – The Great Controversy, p. 416. "The cleansing, both in the typical and in the real service (Heavenly Temple), must be accomplished with blood (blood of the Lamb of God)." – Ibid., p. 417. "Such was the service performed 'unto the example and shadow of heavenly things.' AND WHAT WAS DONE IN TYPE IN THE MINISTRATION OF THE EARTHLY SANCTUARY IS DONE IN REALITY in the ministration of (Christ in) the heavenly sanctuary (Heb. 9:24)." - Ibid., p. 420. "So did Christ plead His blood before the Father in behalf of sinners (when He ascended), and present before Him also, with the precious fragrance of His own righteousness, the prayers of penitent believers. Such was the work of ministration (Ceremonial Law) in the first apartment of the sanctuary in heaven (even now)." -Ibid., p. 421. ". . .so in the NEW COVENANT the sins of the repentant are by FAITH placed upon Christ and TRANSFERRED, in fact, to the Heavenly Sanctuary." – Ibid. A little child can see that when the ANIMAL sacrifices pointing to Him CEASED ON EARTH, at the death of Christ, that He TRANSFERRED ALL THE SACRIFICIAL OFFERINGS to HEAVEN, and is a HIGH PRIEST of the Heavenly CEREMONIAL LAW – OFFERING HIS BLOOD according to the types bf the EARTHLY SANCTUARY pattern shown to Moses in the mount (Ex. 25:9,40). manded by the Ceremonial Law, is NOW representing (GIVING LIFE TO) the repentant sinner (as shown in the types) before the Father that he may have LIFE ETERNAL WITHOUT DEATH – A NEW AND LIVING WAY for the remnant of Jacob and all who shall call upon His NEW NAME (Rev. 3:12). Hebrews 9:14 shows Christ, THE SACRIFICE, and the ETERNAL SPIRIT (Meichizedek), the HIGH PRIEST – two intercessions. "The work of Christ as man's intercessor is presented in that beautiful prophecy of Zechariah concerning Him 'WHOSE NAME IS THE BRANCH."' – The Great Controversy, p. 415. Christ spoke of "ANOTHER" Comforter who WOULD COME IN HIS NAME. This was partially fulfilled on the DAYof Pentecost at the third hour, after Christ was offered in Heaven on the 18th day of the first month, on the resurrection day. Therefore, since Jesus, as our "Intercessor," is depicted in that beautiful prophecy of Him Whose name is THE BRANCH (G.C. 415), then the HOLY SPIRIT, "ANOTHER COMFORTER," sent in Jesus' name (John 14:27), would also have the SAME NAME, "BRANCH," (SHE, the Lord our Righteousness, Jer. 33:15,16). Ellen G. White had a vision of the FINAL ATONEMENT to be made by Jesus in the Heavenly Sanctuary above, and the great TRUTH of the Day of Atonement was RESTORED AND OBSERVED in ANTITYPE, October 22, 1844. "Under the Mosaic system the cleansing of the sanctuary, or the great Day of Atonement, occurred on the tenth day of the seventh Jewish month (Leviticus 16:29-34), when the high priest, having made an atonement for all Israel, and thus removed their sins from the sanctuary, came forth and blessed the people . ....The tenth day of the seventh month, the great Day of Atonement, the time of the cleansing of the sanctuary, which in the year 1844 fell upon the twenty-second of October was in harmony with the proofs already presented that the 2300 days would terminate in the autumn..." - The Great Controversy, p. 400.
which descended on the day of Pentecost carried the minds of the disciples from the EARTHLY SANCTUARY TO THE HEAVENLY, where Jesus had ENTERED BY HIS OWN BLOOD (ceremonial law), to shed upon His disciples the benefits of His atonement." -Early Writings, pp. 254,255,260. Here it is seen that the "THIRD Angel" is called "another" mighty angel in 1844, a PARTIAL fulfillment of Jesus' prophecy in John 14:26. This is a view of the Bridegroom He (Jesus, Jer. 23:5,6) preparing for His Bride (She, Jer. 33:15,16) in the Most Holy apartment of the Heavenly Sanctuary. John the Revelator saw a picture of the Bride, the Holy City, New Jerusalem, the Mother of us all (Gal. 4:26) coming down from God out of Heaven to gather her children together and RETURN to Her place. 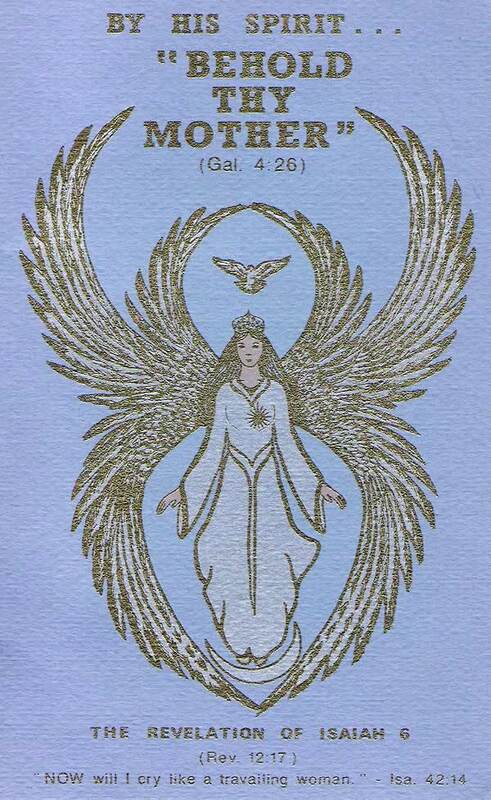 This is a vision of the Holy Spirit, the Third Angel, descending to earth in the form of the Mighty Angel of Revelation 18:1 (in behalf of the righteous living who are to be translated without seeing death), in a message about the PERSONALITY and INTERCESSION of the Holy Spirit Mother, the FINAL fulfillment of the prophecy uttered by Jesus to His disciples, of the coming of "ANOTHER" Comforter in HIS NAME (John 14: 26), Who is The Holy Spirit coming in the person of HER representative in a MESSAGE to reveal the PERSONALITY of the Holy Shekinah (the Holy Spirit). The descent of the SHEKINAH to the Mercy Seat of the EARTHLY SANCTUARY gave SIGNIFICANCE to the MINISTRY OF THE PRIEST! Without the Divine PRESENCE of the Holy Spirit, the rituals were meaningless, devoid of the atonement (at-one-ment), without the approval and ACCEPTANCE of the Eternal ONE Whose abiding place was in the Most Holy apartment between the cherubim. Likewise, Jesus as our High Priest presented His offerings TO the PRIEST OF THE MOST HIGH GOD, MELCHIZEDEK, the Eternal (Holy) Spirit (Heb. 9:14). Early Writings, pages 280,281 teaches the same truths. "In that fearful time, AFTER the CLOSE OF JESUS' MEDIATION, the saints were living in the sight of a holy God, WITHOUT AN INTERCESSOR (in the Most Holy Place). Every case was decided, every jewel numbered. Jesus TARRIED A MOMENT (Lev. 16:18,21) in the OUTER APARTMENT (Holy Place) of the heavenly sanctuary, and the SINS which HAD BEEN CONFESSED WHILE He was in the MOST HOLY PLACE were placed upon Satan, the originator of sin, who must suffer their punishment. Then I saw Jesus lay off His priestly attire (Lev. 16:23) and clothe Himself with His most kingly robes .... He left Heaven." Ellen G. White was given a prophetic view of Jesus' coming in the Judgment of the LIVING to the EARTHLY SANCTUARY, His church, in Judgment to execute justice and separate the wicked from the righteous. ". . 'the Lord Jesus shall rise up from His mediatorial work in the heavenly sanctuary and shall clothe Himself with the garments of vengeance and surprise them at their unholy feast, and they will find themselves unprepared for the marriage supper of the Lamb.'" – Testimonies, Vol. 5, p. 690. "What time is here referred to? Not to the revelation of Christ in the clouds of heaven to find a people asleep. No; but to His return from His ministration in the most holy place of the heavenly sanctuary, when He lays off His priestly attire and clothes Himself with garments of vengeance. . ." - Testimonies, Vol. 2, p. 190. He pauses in the HOLY PLACE to put the sins that are confessed, WHILE HE IS IN THE MOST HOLY, on the head of the LIVE GOAT, which is sent away into the wilderness – the symbol of the sacrificial (Sanctuary) service away from the vineyard, JERUSALEM, the STATIONARY THRONE of God on earth. That is, the sacrificial service in the wilderness is a TYPE OF GOD'S MOVABLE THRONE. The wilderness is a symbol of the Land of the GENTILES (especially U.S.A.), where the 12 tribes were scattered UNTIL they are gathered AGAIN to their own land, ISRAEL, which is the vineyard where the PERMANENT THRONE of the Lord (the Sanctuary) is again to be raised up (Acts 15:16) in fulfillment of the promise of the LAND given to Abraham and his seed. Thus it is, that wherever Israel wanders (away from the vineyard – Jerusalem) the Holy Shekinah (The Holy Spirit) goes with them, to turn them AGAIN to HER palace – The Throne of Glory in Jerusalem. In fulfillment of E. G. White's prophetic vision of Jesus' ministration in the Heavenly Sanctuary, FIRST for the dead (1844); THEN for the Living (future), a MESSAGE about the coming of Jesus with a NEW NAME for the Judgment of the Living was brought by Benjamin Roden in October, 1955. The name was revealed by an audible voice speaking to him about Sister White's prophecies in Early Writings, page 15; The Great Controversy, page 415; Testimonies, vol. 5, page 472, "Joshua and the Angel," Isaiah 62:2, Isaiah 11: 1, Isaiah 4:2, and Revelation 3:12 and 2:17, about the revelation of Christ to His church under a NEW NAME, The Branch, HE, the Lord our Righteousness (Jer. 23:5,6) and of "ANOTHER" BRANCH, THE HOLY SPIRIT, SHE, the Lord our Righteousness (Jer. 33:15,16) during the Judgment of the Living. In fulfillment of Benjamin Roden's prophecies about the Branch, SHE, the Lord our Righteousness, Mrs. Benjamin Roden was given a REVELATION about the INTERCESSION of the Holy Spirit in the Judgment work for the LIVING, of those WHO SHALL NEVER DIE. The nature, GENDER, and PRIESTHOOD of the Holy Spirit has, and still is, being revealed to the "remnant" of Her seed (Gen. 3:15; Rev. 12:17) who shall be TRANSLATED, without dying, to the Heavenly Courts where they shall talk face to face with God, Christ, and the Holy Spirit AS IN THE BEGINNING IN THE GARDEN OF EDEN. clouds, to meet the Lord in the air: and so shall we ever be with the Lord." 1 Thess.4:17. "Likewise the Spirit also helpeth our infirmities: for we know not what we should pray for as we ought: but the SPIRIT itself MAKETH INTERCESSION for us with groanings which cannot be uttered. . . Who is he that condemneth? It is Christ that died, yea rather, that is risen again, who is even at the right hand of God, who also maketh INTERCESSION for us." Rom. 8:26,34. Two INTERCESSORS before the Father's Throne – Male and Female. "Whereof the Holy Ghost also is a WITNESS to us: for after that he had said before, This is the COVENANT that I will make with them after those days, saith the Lord (by the Power of the Spirit), I will put my laws (two: moral and ceremonial) into their hearts, and in their minds will I WRITE THEM .... Having therefore, brethren, boldness to enter into the holiest BY THE BLOOD OF JESUS, By a NEW AND LIVING WAY, which he hath consecrated for us, through the vail, that is to say, HIS FLESH .... Let us draw near with a true heart in full assurance of faith, having our HEARTS SPRINKLED from an evil conscience, and our bodies WASHED WITH PURE WATER ...For if we sin wilfully after that we have received the knowledge of the truth (of the Holy Spirit), there remaineth NO MORE SACRIFICE FOR SINS... Of how much sorer punishment, suppose ye, shall he be thought worthy, who hath trodden under foot the Son of God, and hath counted THE BLOOD OF THE COVENANT, wherewith he was SANCTIFIED, an unholy thing, and hath done despite unto the Spirit of grace... It is a fearful thing to fall into the hands of the living God." Heb. 10:15,16,19,20,22,26,29,31. Revelation of the Trinity: The Father is revealed in the Ten Commandment law! Christ is now revealed in the ANTITYPICAL SACRIFICIAL OR CEREMONIAL LAW! The Holy Spirit is revealed in the Law of the Spirit of Life Eternal. "There is therefore now no condemnation to them which are in Christ Jesus, who walk not after the flesh, but after the Spirit. For the law of the Spirit of life in Christ Jesus hath made me free from the law of sin and death." Rom. 8:1,2. The Sabbaths (plural) of the Lord – "STATUTES FOREVER throughout your generations." Verse 2: "Speak unto the children of Israel, and say unto them, CONCERNING THE FEASTS OF THE LORD, which ye shall proclaim to be holy convocations, EVEN THESE ARE MY FEASTS." Verse 3: "Six days shall work be done; but the seventh day is the sabbath of rest, an holy convocation; ye shall do no work therein: it is the sabbath of the Lord in all your dwellings." THE NEW TESTAMENT COMMISSION is: "Pray ye that your flight be not... ON THE SABBATH DAY." Matt. 24:20. Verse 5: "In the FOURTEENTH DAY of the first month at even is the Lord's passover. And on the FIFTEENTH day of the same month is the feast of unleavened bread unto the Lord: seven days ye must eat unleavened bread (1st day – holy – 7th day – holy)." The Messiah instituted the humility service and the emblems of His broken body and spilled blood BEFORE His great sacrifice on the cross, and the significance of the animal sacrifice ceased – replaced by the spotless LAMB of God Who taketh away the sins of the world (John 1:29). Believers were commanded to keep THIS SACRIFICIAL SERVICE (the ANTITYPE of the animal sacrifice) as long as time should last. Therefore, we should observe the Sacrificial Law in ANTITYPE as did the Apostles. THE NEW TESTAMENT COMMAND is, "Purge out therefore the OLD leaven, that ye may be a NEW LUMP, as ye are unleavened. For even Christ our PASSOVER is sacrificed for us: Therefore LET US KEEP THE FEAST, not with OLD leaven, neither with the leaven of malice and wickedness; but with the unleavened bread of sincerity and truth." 1 Cor. 5:7,8.
come into the land which I give unto you, and shall reap the harvest thereof, then ye shall bring a SHEAF of the FIRSTFRUITS of your harvest unto the priest: And tie shall WAVE the SHEAF before the Lord, to be accepted for you: ON THE MORROW AFTER THE SABBATH the priest shall wave it." According to the Law of the Old Covenant, the wavesheaf was offered on the SECOND DAY of the feast – Friday, of the Passover week, A.D. 31, "on the morrow after the (PASSOVER) sabbath," which fell on Abib the 14th AT EVEN, or the beginning of Thursday the 15th. The Messiah was crucified on Friday the sixteenth, the second day of the feast, to fulfill the demands of the Sacrificial Law to make ATONEMENT for Israel. In the transition between the OLD and NEW Covenant, The Messiah was offered on Sunday, the 18th, in Heaven on the morrow after the seventh-day Sabbath in the Sanctuary above. The morrow after the seventh-day Sabbath is the time at which the Wavesheaf of the NEW COVENANT SACRIFICE is to be presented in future times during the Passover observance (The Great Controversy, p. 399). "For the PRIESTHOOD BEING CHANGED, there is made of necessity A CHANGE ALSO OF THE LAW .... Then said he, Lo, I come to do thy will, O God. He taketh away the FIRST, that he may ESTABLISH THE SECOND." Heb. 7:12; 10:9. Verses 15,16: "And ye shall count unto you from the morrow after the sabbath, from the day that ye brought the sheaf of the wave offering; seven sabbaths shall be complete: Even unto the morrow after the seventh sabbath shall ye number fifty days; and ye shall offer a new meat offering unto the Lord." Verse 17: "Ye shall bring out of your habitations TWO wave loaves (symbols of Judah and Israel). . .of fine flour; they shall be baken with leaven; they are the FIRSTFRUITS unto the Lord." Verse 21: "And ye shall proclaim on the selfsame day, that it may be an holy convocation unto you: ye shall do no servile work therein: it shall be a statute forever in all your dwellings throughout your generations." was signalized by the outpouring of the Holy Spirit. On the day of Pentecost the Spirit was given." - Christ's Object Lessons, p. 120. "And when the day of Pentecost was fully come, they were all with one accord in one place. . And there appeared unto them cloven tongues like as of fire, and it sat upon each of them." Acts 2:1,3. The early church observed the Levitical Law in ANTITYPE AFTER THE RESURRECTION AND ASCENSION. The wave loaves were offered on the 50th day after the wave sheaf offering as an EXAMPLE for believers, who TODAY, recognize that Pentecost was also observed in Heaven in A.D. 31 and who expect to receive the outpouring of power in the Latter Rain on the Antitypical DAY of Pentecost. Psalms 81: Verses 1,3,4: "Sing aloud unto God our strength: make a joyful noise unto the God of Jacob .... Blow up the trumpet IN THE NEW MOON, in the time appointed, on our solemn feast day. For this was a statute for Israel, and a law of the God of Jacob." Isaiah 66: Verses 22,23: "For as the new heavens and the new earth, which I will make. . . And it shall come to pass, that from one NEW MOON to another, and from one SABBATH (seventh day) to another, shall ALL flesh come to WORSHIP before me, saith the Lord." A STATUTE FOREVER, EVEN IN THE NEW EARTH.
" 'And it shall come to pass, that from one new moon to another, and from one Sabbath to another, shall all flesh come to worship before Me, saith the Lord.'" -Prophets and Kings, pp. 732,733. "God teaches that we should assemble in His house to cultivate the attributes of perfect love. This will fit the dwellers of earth for the mansions that Christ has gone to prepare for all who love Him. There they will assemble in the sanctuary from Sabbath to Sabbath, from one NEW MOON TO ANOTHER, to unite in loftiest strains of song, in praise and thanksgiving to Him who sits upon the throne, and to the Lamb for ever and ever." – Testimonies, vol. 6, p. 368. Verses 27,32: "Also on the tenth day of this seventh month there shall be a day of atonement: it shall be an holy convocation unto you; and ye shall afflict your souls, and offer an offering made by fire unto the Lord .... It shall be unto you a sabbath of rest, and ye shall afflict your souls: in the ninth day of the month at even, from even to even, shall ye celebrate your sabbath." Verse 31: "A STATUTE FOR EVER THROUGHOUT YOUR GENERATIONS." In 1844 the DAY OF ATONEMENT was REinstituted at the end of the 2300 days of Daniel 8:14. "Under the Mosaic system the cleansing of the sanctuary, or the great Day of Atonement, occurred on the tenth day of the seventh Jewish month (Leviticus 16:29-34), when the high priest, having made an atonement for all Israel, and thus removed their sins from the sanctuary, came forth and blessed the people . .... The tenth day of the seventh month, the great Day of Atonement, the time of the cleansing of the sanctuary, which in the year 1 844 fell upon the twentysecond of October . . . .This was in harmony with the proofs already presented that the 2300 days would terminate in the autumn. . ." – The Great Controversy, p. 400. Verses 34,39: "Speak unto the children of Israel, saying, The fifteenth day of this seventh month shall be the feast of tabernacles for seven days unto the Lord .... Also in the fifteenth day of the seventh month, when ye have gathered in the fruit of the land, ye shall keep a feast unto the Lord seven days: on the first day shall be a sabbath, and on the eighth day shall be a sabbath." "Well would it be for the people of God AT THE PRESENT TIME to have a FEAST OF TABERNACLES. . ." – Patriarchs and Prophets, pp. 540,541. "The cry of Christ to the thirsty soul is still going forth, and it appeals to us with even greater power than to those who heard it in the temple on that last day of the feast (of tabernacles)." - The Desire of Ages, p. 454. Verse 41: "IT SHALL BE A STATUTE FOR EVER IN YOUR GENERATIONS." Verse 44: "AND MOSES DECLARED UNTO THE CHILDREN OF ISRAEL THE FEASTS OF THE LORD." All these feasts are NOT to be kept today, EXCEPT IN ANTITYPE, as the 120, Paul, and the early church observed them AFTER THE CRUCIFIXION AND ASCENSION OF JESUS: the Passover, Pentecost, Daily, etc. other members of the company passing on to Troas to await him there. The Philippians were the most loving and true-hearted of the apostle's converts, and during the eight days of the feast he enjoyed peaceful and happy communion with them." – The Acts of the Apostles, pp. 390,391. "The Pentecostal outpouring was Heaven's communication that the Redeemer's inauguration was accomplished. According to His promise He had sent the Holy Spirit from heaven to His followers, as a token that He had, as priest and king, received all authority in heaven and on earth, and was the Anointed One over His people .... Pentecost brought them the heavenly illumination." – Ibid., pp. 39,45. "On the day of Pentecost the Spirit was given. Christ's witnesses proclaimed the power of the risen Saviour. . . These scenes are to be repeated, and with greater power. The outpouring of the, Holy Spirit on the day of Pentecost was the former rain, but the latter ram will be more abundant. The Spirit awaits our demand and reception. Christ is AGAIN to be revealed in His fullness by the Holy Spirit's power." – Christ's Object Lessons, pp. 120,121. "When we bring our hearts into unity with Christ, and our lives into harmony with His work, the Spirit that fell on the disciples on the day of Pentecost will fall on us (in the Latter Rain, on the antitypical DAY of Pentecost)." – Testimonies, vol. 8, p. 246. "This scripture shows, moreover, that the manifestation of the Spirit, in the second Pentecost, is to be much greater than the former, that in comparison the former was but a sample." – 2 T. G. 19:10. "And what was done in type (keeping the feast days) in the ministration of the earthly sanctuary IS DONE IN REALITY in the ministration of the HEAVENLY SANCTUARY. After His ascension our Saviour began His work as our high priest (keeping the Ceremonial Law in antitype)." - The Great Controversy, p. 420. "Well would it be for the people of God AT THE PRESENT TIME to have a FEAST OF TABERNACLES, – a joyous commemoration of the blessings of God to them." - Patriarchs and Prophets, pp. 540,541. "We should therefore understand the signs of the times, perform our vows unto God, KEEP OUR SOLEMN FEASTS, and do everything in God's order so as to be found righteous, ready to escape the doom of the wicked, and to march on to the Kingdom." – 1 T. G. 24:11. "Broadly speaking, the law of Moses consists of three parts. The first is the Ceremonial law, the law of the temple – the sacrificial law. This law, of course, we today must NOT observe, EXCEPT IN ANTITYPE . . . .Nah. 1:15. . . .O Judah, KEEP THY SOLEMN FEASTS... for the wicked shall no more pass through thee. . ."-2 T.G. 37:14,15,25. Conclusively, therefore, it is the KEEPING OF THESE FEASTS that CLEANSES and PREPARES THE CHURCH TO STAND in the hour of temptation – the day of the great apostasy where man's laws are SUBSTITUTED for God's Commandments, Statutes and Judgments. "As Christ at His ascension appeared in the presence of God to PLEAD HIS BLOOD (Ceremonial Law) in behalf of penitent believers, so the priest in the daily ministration sprinkled the blood of the sacrifice in the holy place in the sinner's behalf." – Patriarchs and Prophets, p. 357. "The blood of Christ (Ceremonial Law), while it was to release the repentant sinner from the condemnation of the law (10 commandments), it WAS NOT TO CANCEL THE SIN; it would stand on record in the sanctuary UNTIL THE FINAL ATONEMENT; SO IN THE TYPE THE BLOOD OF THE SIN OFFERING REMOVED THE SIN FROM THE PENITENT, BUT IT "RESTED" IN THE SANCTUARY "UNTIL" THE DAY OF ATONEMENT." – Ibid. "Thus in the ministration of the tabernacle (Ceremonial Law)... the people were taught each day the great truths relative to Christ's death (Sacrificial Law) and ministration (Ceremonial Law), and. . were carried forward to the CLOSING EVENTS of the great controversy (the Judgment of the Living). . . " – Ibid., p. 358. "When Adam and his sons BEGAN to offer the CEREMONIAL SACRIFICES ordained by God as a TYPE of the coming Redeemer (His shed blood), Satan discerned in THESE A SYMBOL OF COMMUNION between earth and heaven... he sought to misrepresent God and to MISINTERPRET the RITES pointing to the Saviour (His sacrifice). . ." – Prophets and Kings, p. 685. "Thus the sacrifices and the ordinances designed of Heaven (The Ceremonial Law) to REVEAL DIVINE LOVE (in Christ's death on the cross), have been perverted (and taken out of the way by the man of sin). . ." – Ibid., pp. 685,686. IN REFUSING TO OBSERVE THE RITES OF THE SANCTUARY SERVICE (THE FEASTS OF THE LORD, LEV. 23), IN ANTITYPE, WHICH POINT TO THE SAVIOUR'S MINISTRATION IN THE HEAVENLY SANCTUARY ABOVE FOR US NOW (HEB. 9:24), THE CHURCH AND THE WORLD STAND IN OPEN DEFIANCE OF THE REQUIREMENTS OF GOD'S LAW (BOTH MORAL AND CEREMONIAL) – GUILTY OF THE BLOOD AND BODY OF THE SON OF GOD. At His FIRST Advent: "These TYPES were fulfilled, not only as to the EVENT, but as to the time pointed out in the symbolic service (Passover)." – The Great Controversy, p. 399. "IN LIKE MANNER the TYPES which relate to the second advent must be fulfilled at the TIME pointed out in the SYMBOLIC SERVICE (the Atonement)." -Ibid. Thus the Remnant Church will be well instructed in the Levitical Law and its significance IN ANTITYPE. studied will enable us to understand better the rule of faith and practice that we are to follow in our dealings with one another. . . (Letter 3, 1905). . ." – S.D.A. Bible Commentary, vol. 7-A, p. 42. THEREFORE, LET US KEEP THE FEASTS OF THE LORD AND MARCH ON TO THE KINGDOM OF GOD! "Only in the light of REVELATION can it be read aright. . . Only by the aid of that SPIRIT... of that 'TRUE LIGHT'. . . can the TESTIMONY of SCIENCE be RIGHTLY INTERPRETED." -Education, p. 134. "To him who learns thus to interpret its teachings, all nature becomes illuminated; the world is a lesson-book, life a school. The unity of man with nature and with God, the universal dominion of law, the results of transgression, can not fail of impressing the mind and moulding the character. . .
"The unseen is illustrated by the seen (Rom. 1:20). On everything upon earth... they may behold the image and superscription of God." – Ibid., pp. 99,100.